I can’t help thinking this poor fellow is looking off into the misty distance thinking “Where did I leave my other antler”. This has to be one of the strangest thing I have ever seen in the park, I’m sure deer manage to lose their antlers during rutting season but I have never personally seen one with only the single antler left. Obviously I will refrain from getting involved with any puns regarding stag nights etc. This shot was taken on a rather beautiful April morning a few years ago, not quite as early as you might think from the mist in the distance, I seem to remember it being around ten o’clock or so. 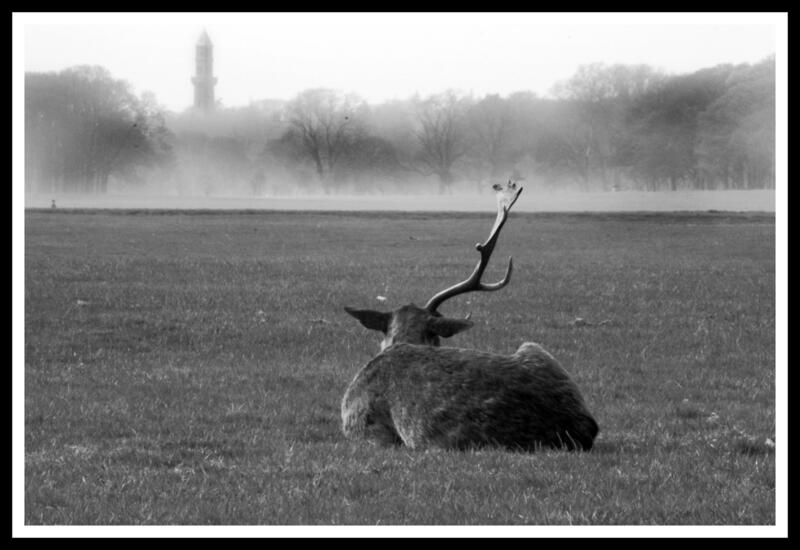 I love the total bleakness of this photo, there is almost an element of resignation about the deer sitting on his own. Maybe he did lose out in a battle with another stag and the damp mist in the distance is just compounding his pure misery. The clocktower you can see in the distance is situated on the grounds of Farmleigh House, worth a visit if you have a chance, it’s been beautifully restored and is a real oasis of calm compared to the rest of Farmleigh during the summer. I remember taking this photo, it took me ages to slowly sneak up behind the deer. I really tried not to disturb him and when he did look around I just acted all casual so he wouldn’t feel threatened. When I think back it was quite comical, I mean does a deer really care if you are looking off into the distance and whistling just so you can convince him you haven’t even noticed him sitting there in the grass. Perhaps I should have brought a newspaper and I could have pretended to read that every time he looked around. I don’t think I would make a very good private detective, I think the giant zoom lens and tripod gave me away on this occasion.. I really didn’t need to worry about anything as the deer had little or no interest in my presence, maybe he was tired after a long battle, I just don’t know. I do have great respect for these animals, sometimes people forget they are actually wild animals and try to get too close. Most times the deer will run away but I just don’t see the point in upsetting them just for the sake of a good photograph.